Three (formerly) blind mice | Community>Bulletin | Cyagen US Inc.
Blindness is a major public health problem. Nearly 40 million people worldwide are functionally blind, while over 250 million people suffer from visual impairment. The major causes of both acquired and hereditary blindness in the developed world are age-related macular degeneration and retinitis pigmentosa, which both share a common pathophysiology. In these conditions, the photoreceptors of the outer retina degenerate irreversibly, leaving the inner retina intact but unable to process visual input. Due to the anatomical and physiological similarities between visual systems across mammalian species, rodent models are incredibly powerful tools for the testing and development of therapies to treat blindness. 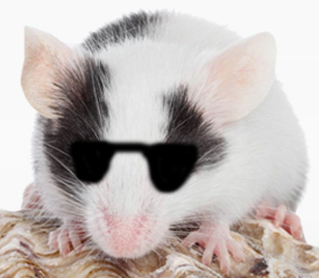 Here are a few examples of how mouse models are being used to give sight to the blind. AAV-based gene therapy was used by Cehajic-Kapetanovic and colleagues to introduce a human rhodopsin gene into the cells of the inner retina in a mouse model of retinitis pigmentosa (hereditary retinal degeneration) (2). Using a promoter driving expression primarily in ‘on’ bipolar interneurons, they were able to restore light-dependent firing of retinal ganglion cells, light-responsive activity in the LGN, and light-dependent behavior, such as avoidance of a swooping owl – All to mice that were blind just weeks earlier. Stem cells hold promise for the treatment of a variety of medical conditions including visual impairment, but a major obstacle preventing translation to clinical use is a lack of methods for the generation and isolation of the necessary cell types from differentiated stem cells or iPS cells. Lakowski and colleagues have solved this problem by identifying a panel of biomarkers that can be used to isolate photoreceptor precursor cells from retinas derived by in vitro differentiation from mouse ES cells (3, 4). These stem cell-derived cells can be transplanted into adult mouse eyes, where they successfully integrate and mature into new rod photoreceptors. Retinal prosthetics are now being used to treat patients with retinal degeneration, but are currently limited in their ability to provide high-sensitivity or high-resolution vision. Sheila Nirenberg and Chethan Pandarinath are developing ways to significantly improve the performance of retinal prosthetic devices by incorporating the retina’s natural neural code (5). They have shown that incorporation of physiological coding significantly increases the effectiveness of prosthetics in mouse models, and also that a combination of retinal coding with high-resolution prosthetic technology is able to improve prosthetic performance such that it nearly matches natural vision. Cyagen Biosciences can help you harness the experimental power of animal models and viral vectors in your own research. We provide custom mouse and rat models, including transgenics, knockouts and knockins, CRISPR/Cas9 and TALEN genome editing, and TurboKnockout® gene targeting. What ideas do you have for solving world health problems? Let us know how we can help. VectorBuilder provides a wide variety of molecular cloning services. Using our innovative online application, you can design custom DNA constructs specific to your experimental needs. Choose from AAV vectors, lentiviruses, shRNA expression vectors, CRISPR/Cas9 vectors, and more! Design what you need, place your order, and we will do your cloning for you.